In a reply to West Tyrone MP Órfhlaith Begley's query on behalf of a constituent, Kelly Tolhurst, the Minister for Postal Affairs at the Department for Business, Energy & Industrial Strategy states the government's position on the ongoing Bates and others v Post Office group litigation. 99.7% of customers living within 3 miles of their nearest branch. to comment further on any matters relating to this litigation. Minister for Small Business, Consumers & Corporate Responsibility"
Whilst I was live-tweeting the Common Issues trial from Court 26 of the High Court's Rolls building, I would often get live feedback, either from observers in the courtroom who would buttonhole me during a break, or online from the people reading my tweets. 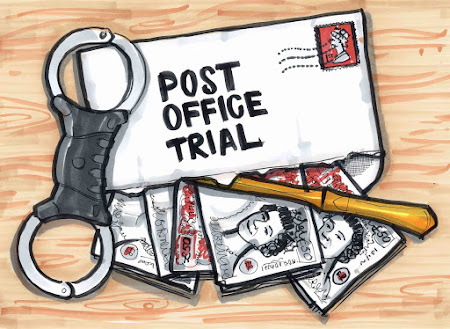 On a couple of occasions I was told that a particular Post Office employee giving evidence from the witness stand was either mistaken, not telling the full story, or lying. These are serious accusations. Without evidence, they cannot be given any credence. Like the claimant witnesses before them all the people listed below swore an oath that what they were saying was true. However, the people making these accusations were adamant they were right, and, to be fair, during her three days on the stand Angela van den Bogerd, the Post Office's People Services Director, was forced to admit she had made a "mistake" with some of the evidence she was giving when she was pulled up on it in court (see Day 8). Now we have the transcripts, we can look at this again. If you have had any dealings at any stage with any of the people below, have a read of their testimony. Does it check out? Do you have direct, personal and verifiable experience that what they are saying is untrue, or are they being straightforward and honest witnesses? Q. Did you ever have any complaints about the skill levels of your team or their efficiency? I have no reason to disbelieve him. However, such a simple exchange appears to have inflamed a number of passions in some correspondents who believe that Mr Williams was mistaken in his assertion. Nick Beal, Head of Agents’ Development and Renumeration. Sarah Rimmer, Agent Remuneration and Expenses Manager. John Breeden, Head of Agency Contracts. Angela van den Bogerd, People Services Director. Timothy Dance, Retail Transformation Integration Manager. Helen Dickinson, Security Team Leader. Michael Shields, Temporary Subpostmaster Advisor. Elaine Ridge, Network Contract Advisor. David Longbottom, Training and Audit Advisor. Michael Webb, Training and Audit Advisor. Michael Haworth, Network Engagement Manager. Andrew Carpenter, Agents Contract Advisor. Brian Trotter, Network Contract Advisor. The links will take you to their evidence. If you have had dealings with any of these people, go and read what they said in their sworn testimony in court. If you believe they are not telling the truth in any aspect of what they say, and can back that up with testimony and/or documentation, get in touch.